The week between Christmas and New Year’s Eve marks a time of quiet reflection for me. Almost everyone is on vacation, things slow down, almost pause, until January 2nd. It’s a time to let go of all the things that did not work in the year before and accept all the changes coming in the year ahead. It isn’t, however, a time to make resolutions, that’s for amateurs. Change happens, whether we resolve to make it so or not. In the past, I use to waste time making a list of all the things I wanted to do and be in the coming year. That usually lead to tremendous disappointment. 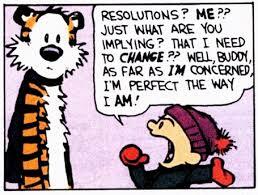 So the last resolution I made was to never make another resolution again. So far, so good! I really love myself the way I am, all my flaws and assets. My bad habits are part of who I am, I’ll change them when I’m good and ready or never, whichever comes first. I am fine tuning things everyday, improvements don’t happen over night or in the course of a single year, they happen throughout life. I dress the body I have, not the one I want and the relationship I have with it is good – see #1. I know what I like, I’ll never be a marathon runner, I will eventually knit a sweater (that might be my biggest accomplishment beside children). No expectations, no disappointments, no need to rebuild my self-esteem. Self care should happen everyday not just the beginning of a year. Being a better person doesn’t require making a huge overhaul just tiny wins on a daily basis. I’m practicing gratitude without worrying about my burdens. Being happy is a choice that you can make on a minute to minute basis. Throughout the years my resolutions, though always well intended, seemed to come from a place of self-loathing, like “I’ll get fit/eat better because my body is awful.” Changes made from a place of self-loathing never stick. Including the time I vowed to cut sugar, cold turkey, one New Year’s Eve. I ended up in a Dunkin’ Donuts 3 weeks after New Year’s day, binge eating munchkins and hating myself even more. It was a sad and lonely day. I learned a little thing called “moderation” that year and things got better from there. The munchkin fiasco of 2009 forced me to strive for balance instead of striving to remove all of my perceived flaws. From there, I discovered the kind of transformation that happens when you make changes from self-respect and love. Like that time I decided to give back and went to New Orleans with Habitat for Humanity. Among many things, I learned how to build a house (that’s a thing I thought I’d never, ever say). It was a defining moment for me and it changed the way I saw the world and my place in it. So I let go of the idea that the purpose of change is to remove the “bad” in me and I opened myself up to the idea that despite my flaws I still deserve to be happy. From there it was more about putting together my bucket list of all the great things I deserved. I have given up on making New Year resolutions, they have never worked out for me. Everything good in my life stems from self-love. 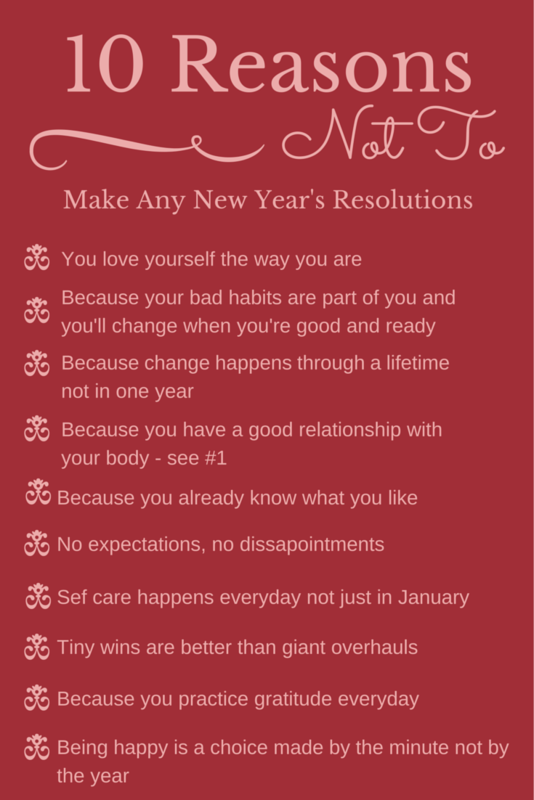 If you are going to resolve to do anything, just resolve to love yourself better and work on that all year through.